These tasty dishes are considered fast food not only because they can be prepared quickly but also because they are, in fact, the Indian equivalent of Western fast food. Each of these recipes is a key player in India's vibrant street food culture and vendors country-wide do a brisk business cooking and selling them. Here are seven recipes to bring a bit of Indian fast food to your kitchen. Paav Bhaaji is western Indian in origin. It is most popular in Mumbai (formerly called Bombay) where you will find scores of vendors over sizzling pans, stirring the ingredients with enthusiasm. Unlike most American fast food dishes, Paav Bhaaji is actually healthy--Paav means "a small bun," while Bhaaji means "vegetable"--and is so wholesome you can have it as a meal. 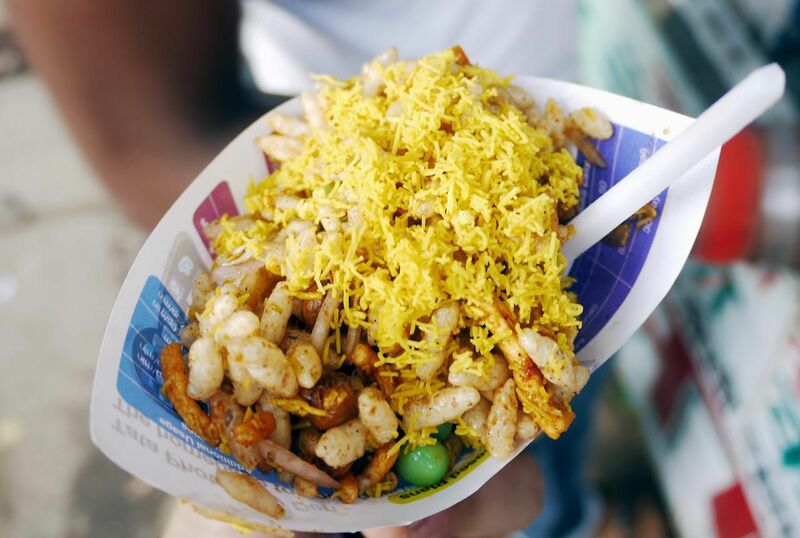 Savory snacks sold from street carts are called "chaats" in India, and this chaat has almost iconic status in the western part of the country. Made from puffed rice and Sev--crunchy noodles--bhelpuri is low-fat, nutritious and delicious. The rice and noodles are mixed with onions, potatoes, and chutneys. For a quick bhelpuri, make the chutneys ahead of time and store the rice puffs and Sev in airtight containers. Then assemble right before eating. This has to be the most popular North-Indian snack. Spiced potato patties (aloo tikki) are stuffed with chole, a chickpea curry. These chaat are served with chutneys, such as coriander-mint chutney and tamarind-dates chutney, as well as shredded vegetables and raitas. Also known as pakoras, these crispy-on-the-outside, tender-on-the-inside fried vegetables are the perfect snack for a cold, rainy day. The beauty is that you can use any vegetable you like, or whatever you happen to have on hand. Make up a batch and serve them with sweet-sour tamarind chutney. Continue to 5 of 7 below. This easy, tasty snack can be put together in a flash--mint-coriander chutney is spread on pieces of bread which are then layered with vegetables such as potatoes, cucumbers, and tomatoes. It is perfect to pack up for a picnic or to put in the kids' lunch boxes. Straight out of the heart of Maharashtra in Western Indian, Vada Pav has iconic status in India. It used to be "poor man's food," but these days even the rich and famous can be spotted eating it at Bombay's (Mumbai) numerous roadside food stalls! Vada (meaning patty) is a potato pattie nestled inside a bun (Pav). The sandwich is then dressed with sweet, hot or tangy chutneys. Pre-making the chutneys and potato mixture will put you one step closer to this delicious snack. The potato patties even taste better when the mixture has sat overnight. Samosas can probably be found anywhere in the world but they are Indian in origin. They are a lovely treat for a cold day when you need something savory and hearty but aren't hungry enough for a whole meal. Shaped as a triangle, these fried snacks are most often filled with potatoes or other vegetables. Flour, ghee, and salt are mixed together to form a dough; after rolling and cutting into semi-circles, the filling is added, the dough is folded up, and the samosa is deep fried to a golden brown and served with a mint chutney. Make Indian-Style Cauliflower Curry in a Snap!